Mah Jongg! Mah Jongg! A woman shouts excitedly just as we began our preview tour of the Skirball’s Project Mah Jongg – a traveling exhibition exploring the history and meaning of the game in Jewish American culture. She’s part of the first foursome to play mah jongg at a game table in the center of the gallery. The women laugh, clap, and chatter away about the surprise ending of their game. Although the exhibition is small in terms of its size, it’s big on design and concept. The exhibition’s striking design, by Pentagram Design, gives visitors their first glimpse into the wonderful world of mah jongg. Colorful gallery partitions, shaped like larger-than-life game tiles, showcase beautiful mah jongg images like dragons and bamboo clusters. 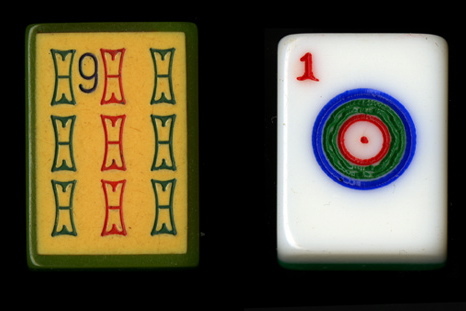 The game of mah jongg is related to Chinese cards and dominos. Players create winning hands from various combinations of the game’s three basic suits: characters, bamboo, and circles (referred to as crak, bam, and dot). The woman who won the first game tells me that mah jongg is a challenging game of skill and chance. The chance part being key to today’s game. She drew the very last tile of the game and, as luck would have it, it turned out to be the one tile she needed to win. Mah jongg came to the U.S. from China in the early 1920’s, and soon became a craze that swept the nation during the roaring 20’s. Americans, already fascinated by all things foreign, enjoyed the game’s exotic nature and mysterious origins. America’s fascination with mah jongg waxed and waned over the years, but the game remains a popular tradition among Jewish-American women. 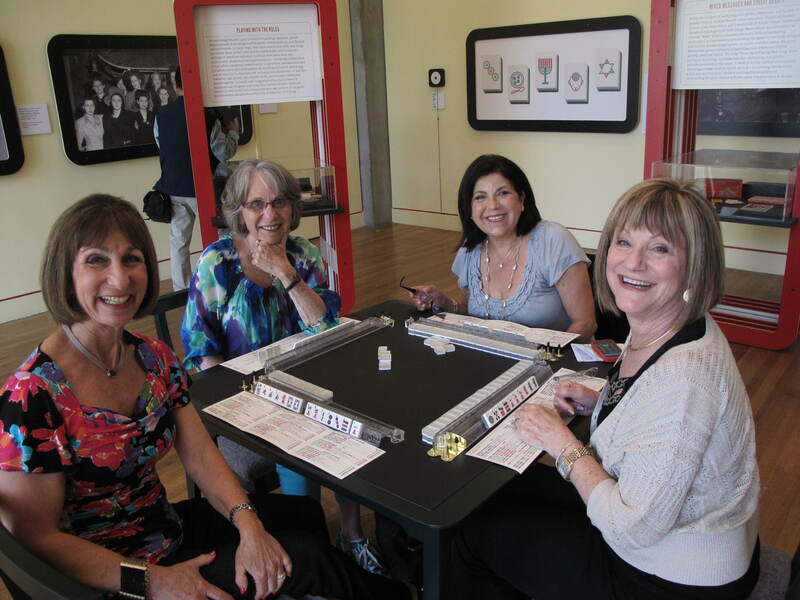 Looking around the exhibition, it’s easy to see that mah jongg is the social glue that has brought generations of Jewish American women together. You’ll see evidence of women who hosted regular game nights in their homes equipped with mah jongg inspired décor, swizzles sticks, and jello molds. 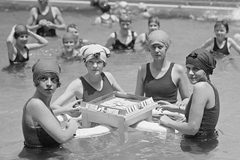 Vintage photographs show the game was so popular that women took their mah jongg game sets everywhere, including summer vacations to the Catskills and even inside the swimming pool. You’ll also see contemporary mah jongg inspired works of art. These works reflect a new generation’s take on the game like Isaac Mizrahia’s sketches of his fictional mah jongg fashion collection complete with a poolside outfit of course. 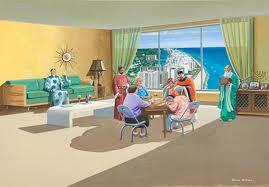 A Bruce McCall painting, depicting Chinese elders passing on the mah jongg tradition to Jewish women in Miami, adds humor to the show. The wall labels include quotes about the artists’ lively mah jongg infused childhood memories. It’s clear from these quotes that grandmothers and mothers are giving more than their Mah Jongg game sets to the next generation — they’re passing along a lifetime of rich family memories. One young woman on the tour fondly recalled the Mah Jong games her mother played with family and friends. As a little girl, she loved hearing the sound of their voices, their laughter and the clickety clack of the game tiles in her house. No matter what the locale, Mah Jongg social gatherings have the power to transform Jewish women’s lives. 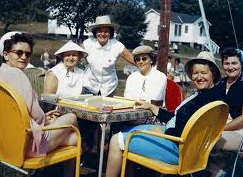 In addition to sharing good-natured gossip and entertaining stories, Mah Jongg gatherings offer women an opportunity to talk about their problems and support each other through hard times, from personal hardships to surviving the Great Depression and WWII. Mah jongg continues to inspire and empower women today, no matter what their age, in very much the same way. 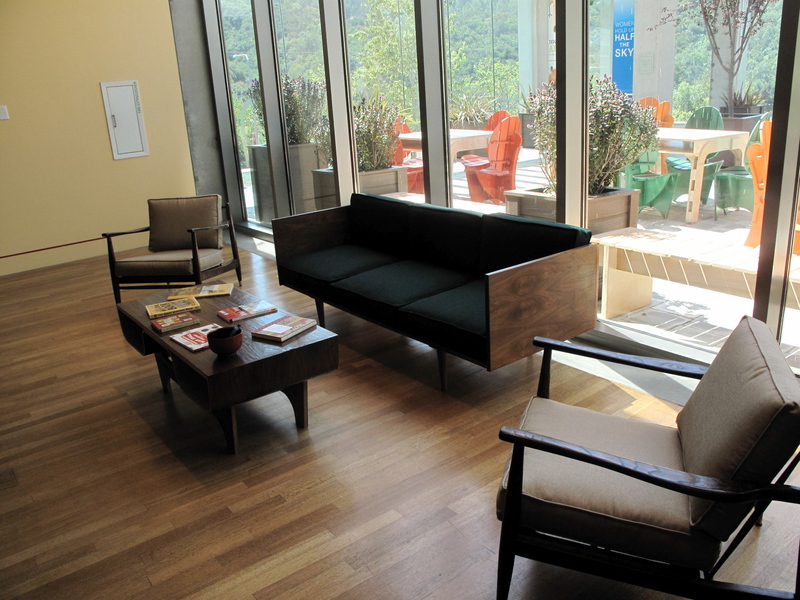 The Skirball encourages visitors to create their own memorable mah jongg experiences, both inside and outside the exhibition. Visitors can play mah jongg with their family and friends in the middle of the gallery (reservations required), or at one of the game tables set-up on the adjacent outdoor terrace. There’s also a special kids game zone for families on the terrace too (details below). The Exhibition’s Design – Check-out one of my favorite Skirblog posts Truck, Bam, Dot by Tom Schirtz, Head of Exhibition Design, to learn more about the design and re-installation of this traveling show. There are great photos of the museum staff piecing it together like a giant puzzle. For Adults – Into the Night: Playtime, Friday July 13, 9:00 pm – 1:00 am. Don’t miss this after hours celebration of music and grown-up fun and games featuring Indie folk stars Sea Wolfe (tickets available online). The Skirball also has a great line-up of Sunset Concerts scheduled for Thursday evenings this summer. Mah Jongg gallery tours offered Tues-Sun at 2:30 pm. For Families – Game On! – Families can play traditional board games on the terrace outside the exhibition, or learn a new game using mah jongg tiles (open Tues-Sun, June 23-Sept 2). 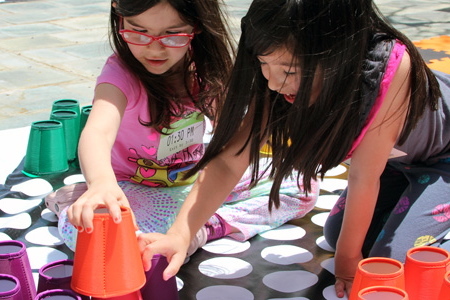 Plus there’s lots of regularly scheduled family fun at the Skirball’s Family Art Studio, Dig it archeological activity, Noah’s Ark interactive space, and weekend Family Amphitheater Performances. Tuesday-Friday, 12:00-5:00 pm, Saturday-Sunday, 10:00 am-5:00 pm. Closed Mondays and holidays. Posted in Exhibition Reviews, Skirball Cultural Center. Tagged as Exhibition Reviews, family activities, Los Angeles Museums, Mah Jongg, Project Mah Jongg, Skirball Cultural Center, things to do in L.A.